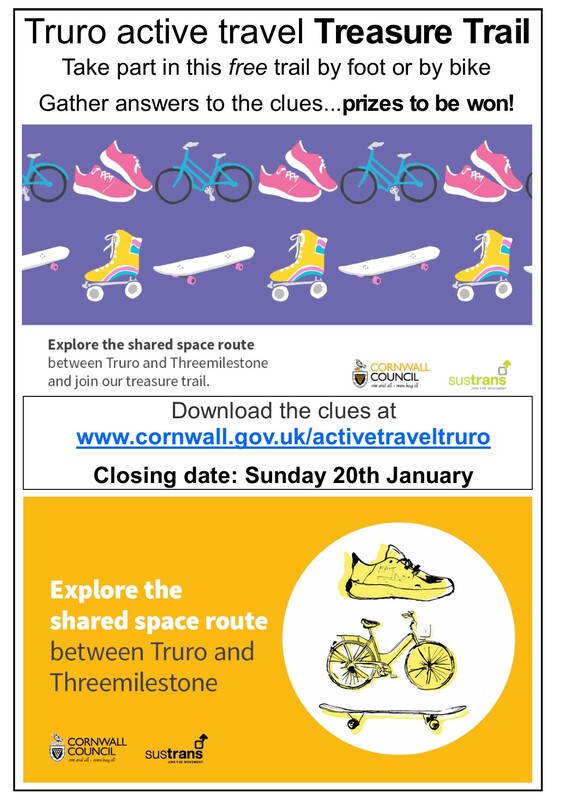 Exciting news…the closing date for the Truro Active Travel Treasure Trail has been extended to Sunday 20th January! allowing more time over the over the festive season to take part. Looking for something active to do over the school holidays…look no further! 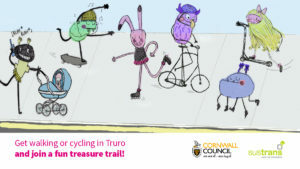 The Treasure Trail is a unique and fun way to discover and explore the new shared paths between Truro and Threemilestone. Join in with the self-led trail by foot, bike or scooter. Simply gather answers to the seven clues and complete the answer sheet. Suitable for all ages (with supervision from a responsible adult). Correctly answered entries will be entered into a prize draw to win one of three £25 One4all high street vouchers, (accepted in over 130 high street stores) in time for Christmas! Four Sustrans goody bags are also up for grabs. Earn extra prize draw entries by completing the optional Threemilestone and Coosebean Greenway routes. Entries can be submitted by e mail or by post, either complete the editable answer sheet on a device/computer or print it off and fill it in. The closing date is Sunday 20th January. 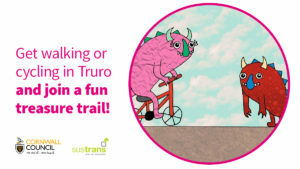 To find out more about the TRU>3MS paths and to take part: download the clues from www.cornwall.gov.uk/activetraveltruro (or search Truro active travel on Cornwall Council’s website).